The Great Race is a mobile-based scavenger hunt that engages kids and their families in a fun, exciting game while introducing them to the benefits of their city spaces. With the aim of spreading awareness about the importance of physical activity to prevent diseases like Type 2 Diabetes, the Great Race hosts multiple city scavenger hunts. Contestants compete in teams to find clues that lead to locations around their city. 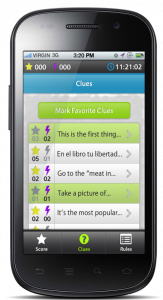 Once they figure out the clues and find the check-in codes, they will be given bonus challenges for more points. Along the five-mile course, the Great Racers will discover an abundance of public spaces their city to have fun, kick the ball around, or relax and enjoy the fresh air. The app allows players to see all the important data they need, such as when and where the race starts, the clues, the challenges, the timer and their points. But because the race appeals to people of all walks of life, older phones also needed to be considered. For this reason, Ayogo implemented a SMS (text-message) system, which allows people with simple mobile phones to play the game by texting in their answers and receiving all the information in condensed texts. All they need to do is learn the simple text commands, such as ‘checkin’ or ‘clue’, to get to playing. If you’d like to participate, please visit The Great Race.